This evening a group of us from the Rideau Nautical Modellers was priveleged to go on an extensive guided tour of the Canadian National Research Council's Canadian Hydraulics Centre. This building has been known to me for many years. It came up many times during university for many examples. The image formed in my brain had always been of a giant wavepool with a 60-segment controlled wave machine. It is so much more than that. The first thing that struck me was just how enormous the facility is, and how extensive their research programs are. 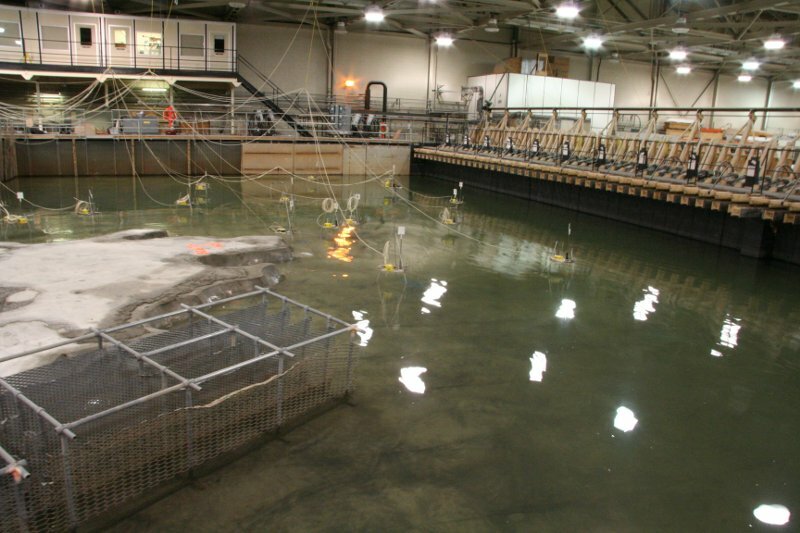 There were no less than four giant wave pools, one of which is housed in a chamber that can be cooled down to a whopping -25°C for ice studies. The next amazing feature is the detail they use when constructing a typical model. In the example we followed, the topography of the area was duplicated in masonite profile slices at half or one metre intervals. Then, the area in between it was filled in with gravel (up to four feet! ), leaving just a couple of centimetres that then gets filled in with concrete/grout. This kind of model is constructed for every study they conduct there. The craftsmanship of the models of ships, rigs, and whatever is needed is equally astonishing, with hulls being rough-cut, machined, and fiberglassed to perfection. The CHC definitely earned its spot onto my list of interesting places in Ottawa.